Nagpur : Four additional judges of Bombay High Court presently working with Nagpur bench were sworn in on Friday at High Court auditorium at a graceful ceremony. Senior Administrative Judge of Nagpur bench Justice Ravi K Deshpande administered the oath to four judges namely Justice Rohit Deo, Justice Manish Pitale, Justice Arun Upadhye and Justice Murlidhar Giratkar in the presence of other sitting judges, former judges, senior lawyers, registry officials and a large number of lawyers. After a long gap, the oath ceremony took place at Nagpur bench itself. The Supreme Court Collegium has recently confirmed 14 additional judges of Bombay High Court and all of them were sworn in as permanent judges on Friday. All the 14 additional judges were appointed on June 5, 2016 and were working with various benches of Bombay High Court since then. These judges include three Nagpurians- Justice Rohit Deo, Justice Bharati Dangre and Justice Manish Pitale. Justice Rohit Deo prior to his elevation as additional judge was the Advocate General of Maharashtra while Justice Bharati Dangre was Principal Law Officer of the Government of Maharashtra for Nagpur bench of Bombay High Court and handled the post of Government Pleader at Nagpur bench with aplomb while Justice Manish Pitale was a well-known Supreme Court lawyer. The Chief Justice of Bombay High Court administered oath to Justice Sandeep Shinde, Justice Bharati Harish Dangre, Justice Sarang Kotwal, Justice Riyaz Chagla at Central Court on Friday morning. 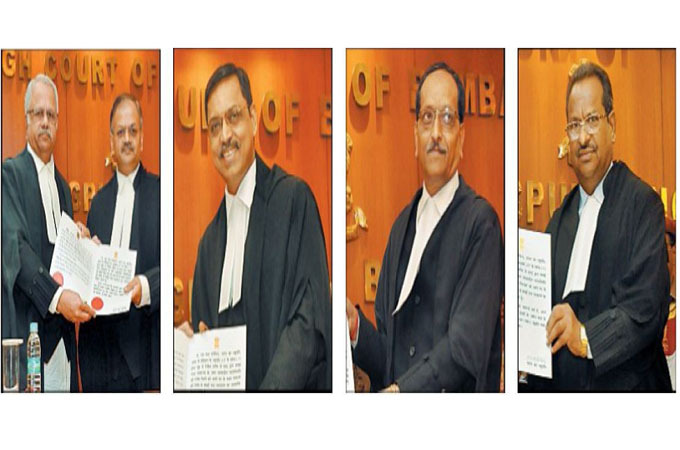 Senior Judge of Auranbgabad bench Justice Prasanna Varale administered oath to Justices Sunil Kotwal, Mangesh Patil, Arun Dhavale, Vibha Kankanwadi and S M Gavhane working at Aurangabad bench while Justice Prithviraj Chavan was administered oath at Goa bench.